WARSAW — With no apparent opposition, updated ordinance amendments for wind and solar power are moving forward. 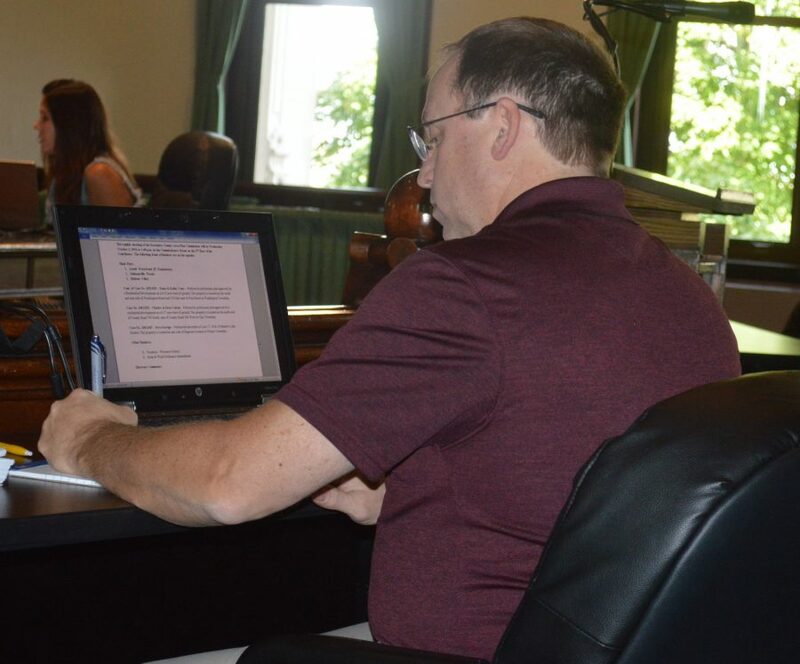 During the regular monthly meeting of the Kosciusko County Area Planning Commission Wednesday afternoon, Oct. 3, in Warsaw, the APC recommended approval of amending the ordinances in the county governing wind farms, micro wind systems and solar systems. Dan Richard, area planning director, noted concerning solar, the ordinance would now better define permitted uses. “It was pretty open ended before,” he said. For large wind generating farms, the only zoning category allowing such farms would be industrial III and an exception would need to be approved by the county board of zoning appeals. Setback requirements are also increased for wind farms. Amending the ordinances is being done in large part due to a detailed presentation by Lynn Studebaker at the August meeting of the planning commission. She cited several negative side effects of wind farms. Richard noted the area planning office had not received a single phone call or question concerning the proposed amendments, which have been advertised in local newspapers. There were no public comments at Wednesday’s meeting. County commissioners will now consider the amendments at their Tuesday, Oct. 16, meeting. In other business, the APC approved a preliminary plat for Dana and Kathy Cone for a residential development on 6.35 acres on what will be Ash Street, a newly named street, east of First Street in Pierceton. The Cones have been working with the town of Pierceton concerning road specifications and installation of utilities. Richard said the development involves replacing a 1869 plat and vacating lots and roadways. A drainage easement on the south side of the plat will need to be relocated and approval was granted with the condition the county surveyor is notified where the easement is relocated. Another condition for approval is an engineer must approve the stormwater runoff and erosion control plans. Also on the agenda, approval was granted for a preliminary plat for Charles and Rose Cotton for a residential development on 6.17 acres just east of Claypool on CR 700S, east of CR 200W in Clay Township. The plat is for two lots, but one lot already has a house on it. Steve Savage was given approval to replat three lots in Shadow Lake Estates on Superior Avenue, just north of Old US 30 in Wayne Township. Savage wants to narrow a 20-foot drainage utility easement to 10 feet in order to have more usable backyard space for the three home owners. In other business, the APC recommended approval to vacate the old portion of Kern Road no longer being used after the road was reconfigured last year in a project at Kern Road and CR 1300N near Wawasee High School. The road right of way vacation is being requested by the Wawasee Community School Corporation. Richard said the vacation is a formality which should have been done earlier. County commissioners will consider the petition at their Oct. 16 meeting. • Final plat approval, hinged on several conditions, was given for the Arnolt Waterfront Estates plat in Oswego at Tippecanoe Lake. Conditions include, among others, a review of the drainage plan and submitting road specifications to the county highway department. The final plat won’t be released or building permits will not be issued until the conditions are met. • Final plat approval was given for the Hudson Valley subdivision, two lots on SR 25 in Wayne Township. • And final plat approval was granted for Johnsonville Woods, a one lot subdivision on Nattie Crow Road near Lake Wawasee.